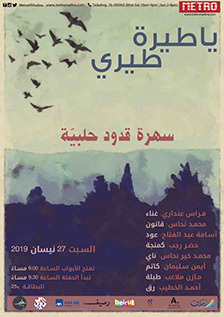 Metro Al Madina presents: Hishik Bishik Show From the weddings and the Cabarets of Egypt in the early 1900s: 10 artists, musicians, singers, actors and dancers take us back to that golden age. "Once Upon a Broadway" is a musical night where Roy will sing the most beloved "Fairytale" Songs of stage and screen in a fun and magical evening that is not to be missed along with the hilarious Scarlett Saad on the piano! فرقة تجلّي تقدّم "عابر سبيل" أمسية موسيقى صوفية معاصرة من مؤلفات فرقة تجلّي، ممزوجة مع أشعار لكبار شعراء الصوفية مثل الحلاج، جلال الدين الرومي، رابعة العدوية و غيرهم.